We apply the method of the User Centered Design Process according to ISO 9241-210 to ensure the best usability for your product. In this process there are different tools and methods to evaluate and optimize your product. We apply 10 different evaluation and optimization methods, each peursuing a different inducement. This method is suitable, if you want to ascertain what features your users really need, instead of trusting in the non-empirical, mostly personal views of team leaders and developers. It only requires about 5 potential users, who are interviewed according to ISO-Rules. Then context scenarios are developed which are transformed into user requirements, resulting in a concrete list of user requirements, that is valid and evidence based and can lead to unanticipated innovations. Based on the specified user requirements, the design solution is evaluated by our experts. The questions “Can the user perform his tasks?” or “Is the functionality of the system sufficient to perform all tasks?” are examined. As a result you get a report based upon which user requirements were met or not met. Focus groups are a good tool to evaluate how users react to your product idea, to get to know their preferences, beliefs, likes and dislikes and even letting them design their own solutions. In the initial stage of a project, a small session of only 7 participants can give you sufficient feedback about how users review your product idea. In the method of the heuristic evaluation our experts test your interactive system according to 10 heuristic usability criteria developed by usability-pioneer Jacob Nielsen. Our experts discover potential usability-issues according to said basic criteria, rate them and make suggestions for improvements. This method gives quick results, is cost efficient and can even be combined with usability tests for an optimum of effectiveness. Depending on the kind of product you want to test and depending on what kind of data you want to get we use different questionnaires mostly together with a quantitative usability method as explained above. The Software Usability Measurement Inventory (SUMI) is a standardized questionnaire, which compares your product to over 2000 software products with only 10 participants needed. You can also use it as a tool for benchmarking your product and validating progress before and after usability improvements. 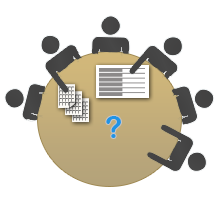 The AttrakDiff is an online questionnaire invented by the UID company. It measures the hedonistic (“joy of use” and user experience) and pragmatic quality (usability) of a product, and displays the results in a clear report. If your project is still in an early stage, where usability testing might not yet be appropriate, two experts of our team work through typical tasks on your system and look for critical incidents according to the guidelines for software ergonomics ISO 9241-110. Each critical incident is categorized according to these ISO guidelines and recommendations for redesign are made. 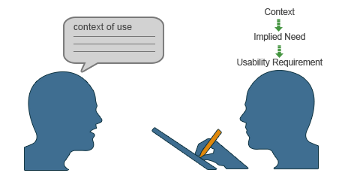 Usability Testing with "Thinking Aloud"
It is widely known that you can detect 80% of critical usability issues of a product by conducting a test with 5 users. Before conducting a usability test, we perform user research, define the major use cases and develop the questions for the test. Then we invite the participants into our usability lab. We have a growing pool of test resources, who have already been casted for previous tests. 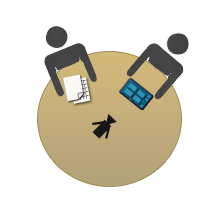 The users are assigned to several tasks, which they have to solve. While thinking aloud we film them for later evaluation. Card-Sorting is a great tool to find out which menu structure fits best to your target group. About 15 participants sort or name menu categories and their subcategories by arranging cards with the category names on it. "If you have questions about usability methods, please contact us directly under p.buchner@n-solut.de or +49. (0) .9131.931071.7"